I will not lie, it was cool to introduce myself as a representative of Change-Can to the volunteers that came out. There was also an opportunity or two to talk about our vision which in turn fostered feedback. My friend Chuck Schoonmaker is the president of the Ponte Vedra Beach Rotary Club. In a monthly meeting we have he shared that PVBRC activities are always open to whomever might like to lend a hand. When he posted on Facebook that they were having a clean-up of the Intercoastal Bridge off 210 I jumped at the first opportunity to act on behalf of Change-Can. The weather was sunny, not too hot, and the people were great. Chuck also supplied Starbucks coffee and caffeine always helps motivate. 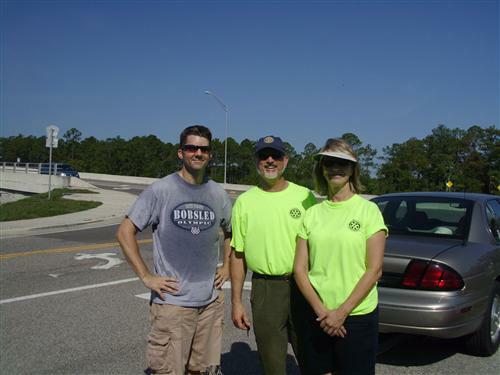 A big thanks to the St. Johns police representative and to all the motorists who drove safely as we walked the bridge along with the forwarding and following roads. I also need to give love to all the cyclists on their morning ride that waved and offered verbal support. You can find pictures of the event here. Thank you to all at the PVB Rotary for making me feel like one of the group. I look forward to helping out at future activities.